Course Web Space - Zachary R. Hagins, Ph.D. Through ANGEL, Penn State's course management system, my students have access to syllabi, reading assignments, images, links to helpful Web sites, updated grades, and discussion boards for exchanging ideas with classmates. 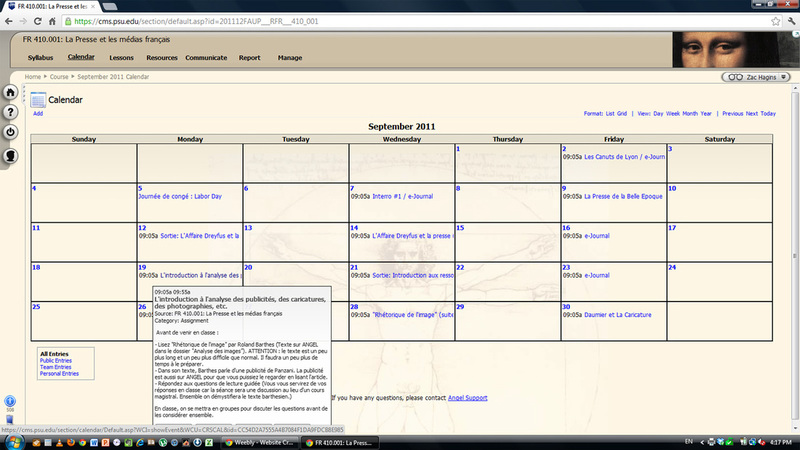 The ANGEL calendar function (seen below) was particularly useful when teaching FR 410: French Press. Because the course content evolves based on current events, the calendar allowed students to be continually aware of what assignments were due but also gave me the flexibility to alter our program when a particularly exciting event occurred in France or another Francophone country. By clicking on the day, students knew precisely what to do prior to arriving in class, making class discussion more productive. Alterations to the calendar also appeared on students' main ANGEL page, allowing them to see the upcoming days' work without requiring them to go into our course site.